May 11, 2017 -- Palestinians accuse FIFA President Gianni Infantino of corruption and nepotism after he blocked the Palestinian Football Association’s motion at today’s FIFA Congress. The motion demanded that the Israeli Football Association abide by FIFA statutes by excluding football clubs based in illegal settlements on occupied Palestinian land. 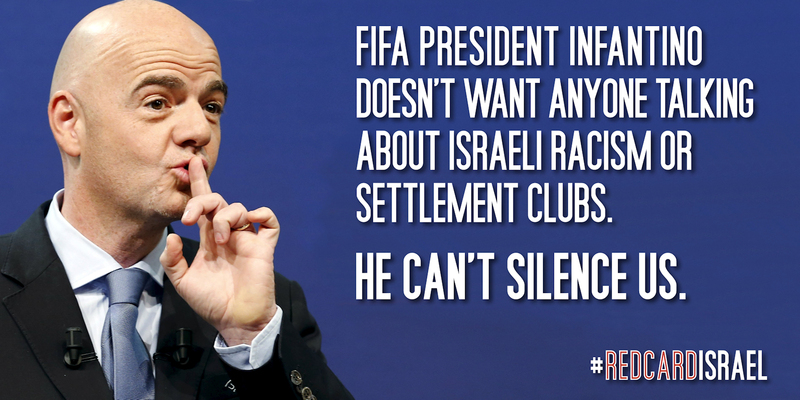 Infantino hijacked the Congress agenda and prevented a vote on the motion, bowing to Israeli bullying tactics. Israeli Prime Minister Benjamin Netanyahu personally called FIFA’s President and presidents of several countries to prevent a vote on Israel’s illegal settlement teams. It is clear that Infantino is following in former FIFA President Sepp Blatter’s footsteps, and that his commitment to upholding human rights is a sham. He had an opportunity to correct FIFA’s disgraceful record of delays and selective enforcement of its statutes, but chose instead to double-down with more of the same unabashed disregard for international law and its own statutes. The FIFA Council prevented the Congress from voting on the issue of Israeli settlements, once again shielding Israel from accountability for its violations of FIFA statutes and Palestinian human rights. Today’s FIFA Congress will stain FIFA’s already damaged reputation. Infantino and FIFA have effectively given Israel a green light to continue its repression of Palestinian sports, arbitrarily arrest Palestinian athletes and to continue to play on stolen Palestinian land. Infantino seems to have fooled himself into thinking this issue will simply go away. This latest capitulation to Israeli bullying will only serve to invigorate the growing movement to suspend Israel from world football, like apartheid South Africa was, until it respects Palestinians human rights. On May 4, 2017, a letter from 174 Palestinian football clubs and sports associations urged FIFA to immediately suspend the Israeli Football Association’s membership over its inclusion of seven football teams based in illegal Israeli settlements. On April 19, 2017, more than one hundred sports associations, trade unions, human rights organizations and faith based groups, representing millions of people from 28 countries across the globe, joined football champions, scholars, film directors, politicians and government officials in calling on FIFA’s Council members to insist that Israel’s national football league revoke the affiliation of seven clubs based in illegal Israeli settlements on occupied Palestinian territory, or face suspension from FIFA. Parliament, more than 40 members of Danish Parliament, 38 members of the British House of Commons as well as Human Rights Watch have all urged FIFA to resolve the issue of settlement clubs.